She has overcome the challenges of widowhood, a broken romance and newspaper publishing, only to have to begin again in a new place. This time, however, her money's been stolen, putting her dream of starting a paper in this Colorado boomtown in jeopardy. Can she find her way and make a new life once more? Book 2 in the Chronicles of the Golden Frontier series. - Publisher She's overcome the challenges of widowhood, poverty, and newspaper publishing. Now if she can only settle the conflict within her heart. With high hopes of the adventure to come, Jennifer DeSpain, along with her family and friends, is embarking on a journey that will change their lives forever. Abandoning the comforts of their home and well-established newspaper, they head east to Colorado. But when the train comes to an abrupt stop, the adventure is just beginning. The Kissing Bandit strikes again--stealing both her money and a kiss! Determined to overcome this loss, Jennifer and her editor, Jason, manage to print the first issues of their new paper. Life is improving until Jason suffers a terrible accident, which forces Jennifer to run the paper herself. Overwhelmed with despair and frustration at the uncooperative press, Jennifer is on the verge of quitting--until two men enter their lives who must be heaven-sent. Preacher brings truth and miracles. And with an eye on Jennifer, the handsome rancher,Lance Rivers insists on taking care of them. Adored by everyone except a bitter and jealous Jason, Lance seems the perfect addition to their family. Can he be the one who Jennifer can finally trust with her heart? About "Unseen Riches (#02 in Chronicles Of The Golden Frontier Series)"
She's overcome the challenges of widowhood, poverty, and newspaper publishing. Now if she can only settle the conflict within her heart. With high hopes of the adventure to come, Jennifer DeSpain, along with her family and friends, is embarking on a journey that will change their lives forever. Abandoning the comforts of their home and well-established newspaper, they head east to Colorado. But when the train comes to an abrupt stop, the adventure is just beginning. The Kissing Bandit strikes again--stealing both her money and a kiss! Determined to overcome this loss, Jennifer and her editor, Jason, manage to print the first issues of their new paper. Life is improving until Jason suffers a terrible accident, which forces Jennifer to run the paper herself. Overwhelmed with despair and frustration at the uncooperative press, Jennifer is on the verge of quitting--until two men enter their lives who must be heaven-sent. Preacher brings truth and miracles. And with an eye on Jennifer, the handsome rancher,Lance Rivers insists on taking care of them. Adored by everyone except a bitter and jealous Jason, Lance seems the perfect addition to their family. Can he be the one who Jennifer can finally trust with her heart? 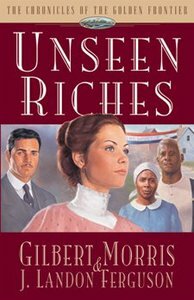 Gilbert Morris is one of todays best-known Christian novelists, specialising in historical fiction. His best-selling works include Edge of Honor (winner of a Christy Award in 2001), Jacobs Way, the House of Winslow series, the Appomattox series, and The Wakefield Saga. He lives in Gulf Shores, Alabama, with his wife, Johnnie. - Publisher. Ferguson is married with three daughters.